Telecoms operator BT has revealed the technical capabilities for their forthcoming pilot of “ultrafast” 300-500Mbps G.fast technology (consumer ISP products should start at 160Mbps), which will be rolled out to cover 25,000 premises in Cambridgeshire and Kent this summer. BT currently plans to make the new G.fast (aka – GEA-NGA2 G.fast or ITU G.9700/9701) service available to 10 million premises by 2020, with “most of the UK” likely to be done by 2025 (this probably equates to around 60% UK coverage). Initially G.fast will only offer top download speeds of ‘up to’ 300Mbps (50Mbps upload), before later increasing to 500Mbps. The full commercial roll-out is due to begin next summer (2017), but before that BT intends to conduct one last large-scale customer pilot and this will give us a good idea of what the final pricing and product setup should look like. In keeping with that BT has now published a new technical document (SIN 520) that offers some useful insights into the final service design. The new pilots (12,500 premises in each location), which will be conducted in Cherry Hinton (Cambridgeshire) and Gillingham (Kent), follow the previous trials in parts of Swansea (Wales), Huntingdon (Cambridgeshire) and Gosforth (Newcastle). The pilot will come in two product flavours (still subject to change before the commercial roll-out), as below. • A peak downstream (from CP to End Customer) rate of up to 330 Mbit/s. • A downstream prioritisation rate of TBC Mbit/s. • An upstream (from End Customer to CP) rate of up to 50 Mbit/s. • A peak downstream (from CP to End Customer) rate of up to 160 Mbit/s. • An upstream (from End Customer to CP) rate of up to 30 Mbit/s. Funnily enough BTInfinity had a 160Mbps FTTP based broadband product (based off Openreach’s 220Mbps service). Otherwise the use of 160Mbps by G.fast may also suggest that Openreach will expand the service reach to a wider area than if they had started with only a 330Mbps product (i.e. speeds tend to fall away sharply on longer copper lines [between the G.fast node and homes/offices]). At this point we should explain that the G.fast technology itself works in a roughly similar way to the current VDSL2 based ‘up to’ 80Mbps Fibre-to-the-Cabinet (FTTC) service, where a fibre optic cable is run to your local Street Cabinet and then the remaining copper run to your home uses VDSL2 to deliver the service. However G.fast requires significantly more spectrum (G.fast 106-212MHz vs VDSL 17-30MHz) and thus it can only deliver its best speeds over much shorter copper lines (less than 350 metres for 300Mbps+). 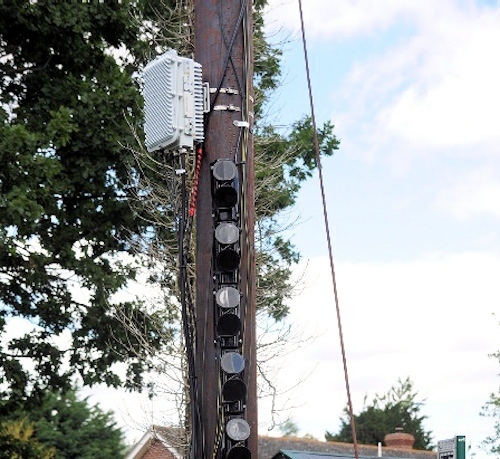 As such G.fast nodes aren’t restricted to mini street cabinets and can also be distributed via small nodes (dp) that may be built either underground (manholes) or placed on top of nearby telegraph poles, usually with a small power supply cabinet sitting nearby. One interesting aspect of the final network setup is with how it appears to confirm that most G.fast deployments will deliver their service from a street cabinet, as opposed to sticking smaller nodes on poles and underground. The latter has the advantage of bringing the service closer to homes (faster speeds), while the use of existing cabinets will save money and we’ve always expected that to be the main approach. According to the new document, the G.fast physical layer will also support all of the modern features that we’ve come to expect from most VDSL2 or ADSL based broadband services, such as its own form of vectoring to reduce cross-talk interference and G.INP (retransmission) for coping with specific types of electromagnetic Interference (impulse noise). The Dynamic Line Management (DLM) service will also be used on G.fast pilot lines, which constantly monitors and manages lines to maintain a target link quality (speed and stability); running once a day based on line performance data collected during the previous day. Elsewhere it’s noted that Openreach are already consulting ISPs on a future Single Order G.fast solution, which is the G.fast variant of their Single Order Generic Ethernet Access (SOGEA) product that currently aims to deliver a standalone (naked) FTTC / VDSL “Fibre Broadband” service without also having to pay a separate rental for the phone service. We’re not expecting SOGEA to reach its commercial launch until 2018 and the G.fast version will probably follow after that. 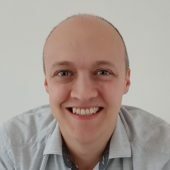 We’ve already written a preview of G.fast modems and BT has previously said that the G.fast trials will adopt a two box solution like earlier FTTC deployments, which means you start with a separate G.fast modem (plugs into your BT Master Socket) and then that connects into an ISP supplied router. No doubt we will eventually end up with a single G.fast router, but not right away. Under this approach an Openreach engineer will need to enter your home in order to attach the provided modem and install a Service Specific Face Plate (SSFP) on the Master Socket (this filters the high frequency G.fast signals from existing legacy products/wiring), which incidentally requires the new NTE5C socket and so the engineer will need to upgrade that too. The SIN states that ISPs will also be able to provide their own G.fast modem if they want, but both modem options (Openreach or ISP supplied) will initially be deployed via an engineer installation (needed due to the NTE5C / SSFP upgrade). However the modem approval process is slow and disliked by a fair few providers, thus many ISPs will probably opt to use Openreach’s kit. The other good news is that there may also be “some customer self-installation deployment options” as part of a trial within the pilot, but the new SIN states that further details will follow in a separate document. We suspect this may involve some sort of plug-in micro-filter solution like with FTTC, but G.fast is quite sensitive and so the performance drawbacks could be more noticeable. Naturally the G.fast modems will need to support the first generation 106MHz spectrum profile (106a or 106b) and they must also be spectrally compatible with other 17.664MHz VDSL2 services when operating in G.fast mode; this helps the two services to co-exist. Furthermore the modems must be capable of supporting an aggregate (i.e. upstream + downstream) bandwidth of 1Gbit/s for 2 to 106MHz operation (G.fast could deliver Gigabit speeds, but only if the node is a few short metres away from your house and in any case BT won’t offer this). Otherwise there’s nothing else worth plucking from the document and we’re keen to find out the first preliminary pricing, which isn’t too far off now. It sounds like Openreach intends to attach a physical G.fast unit (pod) on to the side of existing cabinets, which will be able to hold up to 4 cards (each with 24 ports). But initially early G.fast extension cabinets may only deal with half the number of lines / ports. Quite what then happens when more capacity is needed beyond 96 ports remains unclear, but early demand for such services is likely to be tepid as it could prove difficult to attract customers away from already fast VDSL lines. So it looks like this confirms that the initial G.Fast deployment will be from the PCP only, close to the existing FTTC cab. It was always most likely that way as it’s the fastest, cheapest way of getting it out there. However, I’d expect the trial area to include a significant proportion of FttRN type installations too. OR will probably want to use the exercise to understand the costs of deploying those too. I believe FttRN was done in the earlier trials already. In fact I believe those trials were mostly FttRN. If they are using FttRN here you’d expect the STIN to reflect it in its architecture. They may be quite intentionally deploying near PCP to test cost, performance and speed of deployment. This is especially relevant given the vast majority of the deployment up to 2020, potentially all of the 10 million premises, can be done in this way. Some more coverage can be obtained pretty cheaply through DPUs in MDUs too. Openreach will want to spend the bare minimum and try and milk the existing FTTC equipment as much as possible in the interim as most of the cabinets have a while to go to pay their bills. The trials involved an overlay copper network (no ANFP approval for the real network at the time), and had a high-level architecture to match. The diagram for the pilot has been amended to show connection at the PCP, so I guess it is significant. The only significant differences, from the trial, are the inclusion of G.Fast amendment 2, and the new mention of profile 106b … which I think are to allow power at 8dB instead of 4dB. There are requirements to cope with 2 more bits/tone, and for better noise floor modems – both of which will make sure the hardware has to be better than a basic standard. Lost since the trials seem to be requirements to cope with larger vector groups and better use of spectrum around 20MHz. There’s no FoD2 involved either. Come 2025, and the majority of premises served by BT are still not fibre-optic products. Surely this should give at least some rival telecoms a chance to deploy genuine fibre-optic networks.